This is the face of a beast. Seriously. 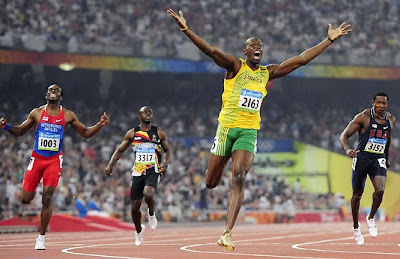 Usain Bolt ran the 200m in 19.30 seconds, breaking the world record set my Michael Johnson in 1996. AND he even slowed down before he crossed the finish line again. He's probably doing it so he can break his own records later on. Today is his 22nd birthday. Happy Birthday.